I've been away for awhile, and as I was looking over past blogs I noticed that I had saved these pics as a draft! It has been quite some time since I took these, and I know what I was going to blog about just from looking at them. I think you will figure it out pretty quickly!!! I am still having this kind of day...problem is I'm out of Calgon, and I have another little monster to help his brother in making messes...LOL! Do you see this face? Sweet little 6 (almost 7) year old Karleigh! I just love her to pieces! She can be honery sometimes, and knows how to stomp all over my last nerve, but she's also got a direct line to my heart! I have thought lately about how I am so busy that I am missing the little things that are going on around here. I have resolved to look for the things that I would normally pass by and not notice in the craziness of life! I can't keep up with anything because I am so unorganized that even if I "file" it away, I forget where the "file" is so I am taking pictures! I thought I'd share a couple of my finds! I almost threw this away before I stopped to notice what it was. We were having company so I quickly went into the front bathroom to wipe it down and make sure it was presentable. As I was cleaning the piles of magazines and notebooks off of the vanity I found this. Karleigh isn't quiet very often, and when she is we always know where to look for her! THE BATHROOM! LOL! I think with her two brothers she needs a place to escape, and the bathroom has become her hideaway! When she is in there she always takes a notebook, pencil, crayons, scissors, book...lots of busy work! On this particular night it looks like she was thinking of her day at school. She practiced addition, and started a list of her classmates! She wanted to post her work, and since we have a crib in her room where her whiteboard and corkboard are supposed to be...she used the band-aid box! What creativity! She even stored her pencil for future use! Now this little gem I found a little earlier in the year and put it away to use in a scrapbook "someday maybe" when I get to do that again. BUT, I lost it for awhile and just recently found it again! This sign was on the bathroom door! It took me a little bit to be able to decipher it, but I got a laugh when I did! For those of you who don't read 6yr old language, it says "No Knocking at the Door when People are in Bathroom". So funny! I have a few more pictures, but they are on my other camera so I will have to share them later. Until I can scrapbook again I thought I'd keep up with this on my blog...well, it's my intention anyway! It HAS NOT been THAT long! I do remember the "terrible two's" now, but I guess it had been so long I had forgotten! I LOVE my "little monster", don't get me wrong, but he can make me want to run for the hills too!!! Jason had to go to a coaching conference in Tulsa Thursday and Friday of this week, and I can say for sure that it is no fun being a SINGLE MOM! I am always tired lately, but after waking up every hour with all 3 kids last night (was something in the air?) I am EXHAUSTED! I don't sleep well anyway when Jason is gone, but whew...I think I might have slept pretty good if the kids would have left me alone last night! Kaleb is still trying to get over ear infections in both ears so he was up every 2 hours. Kole must have had bad dreams because I woke up to him crying 2 times. Karleigh woke up when Kole cried because I was just getting back to sleep when she came to my room and asked if she could go to the bathroom! (I guess she forgot the way! LOL) Bedtime in itself is a job for at least 3 adults in this house! Bathing everyone, and cleaning up all the water splashed halfway down the hall, the sopping wet towels, and clothes is the first part. Next, comes holding Kaleb still long enough to get a diaper and pj's on, and catching Kole (who loves to run naked) and dressing him in the "right" pj's. (it varies from night to night, but if you dress him in the "wrong" ones he will undress in the night and wake up cold) Then, we must convince Karleigh that she is sleepy, very sleepy, and not hungry for yet another snack! When teeth are brushed, hugs and kisses given, prayers said, and everyone is in their bed it is not the end! Someone must stand outside the door to Karleigh's room (like Super Nanny says) and put Kole back down in bed 50 times before he is ready to give in for the night! Finally, we collapse in the computer chair to try and blog (watch tv, read, take a bath, study...)and just as we are starting to relax...KALEB's SCREAMING his head off ! Have you ever read the book "If You Give a Mouse a Cookie"? Well, we often refer to it in our house! One thing leads to another and it feels like we go round and round a lot just like a circle story! Well, as I said, Kaleb's screaming (and not doing a very good job of putting himself back to sleep) so I'd better go now! Hopefully it won't be a matter of months before I'm back again! Well my little girl is officially a big 6 year old first grader! 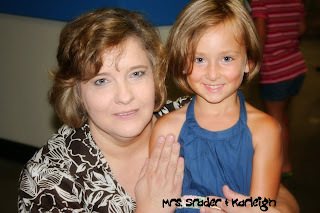 She was so excited for a week before school started because she found out that her teacher would be Mrs. Srader. She knows her from church and I think they talked some last year because Karleigh was just sure she would be her teacher even before Kindergarten was over! We visited the school and took a tour one Sunday evening when Mrs. Srader and her husband were working so that Karleigh would not be overwhelmed in the new building (it's huge)! Then, we went again on "meet and greet" night where these pictures were taken. The theme in Mrs. Srader's room is "The Frog Prince"...I think she likes frogs! 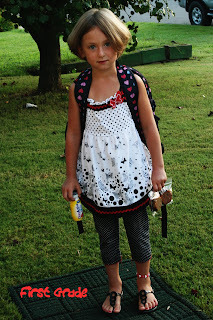 The kids all got to wear a crown on the first day, and that was just GREAT for Karleigh! The first full week of school Karleigh has "come out of her shell" so to speak. She has been in trouble for talking several times. Mrs. Srader had to move her desk one day to get her attention. Karleigh came home and told us each time she got in trouble so I guess it's good that she hasn't tried to hide it! She told me that when Mrs. Srader moved her desk she told her "One more time Miss Karleigh and you won't get reward on Friday!" Now THAT scared her! She's not been BAD, her teacher says she's a "good girl", but I like that Mrs. Srader expects a lot from her! She wants the kids to learn NOW what is expected from them, and with 23 kids in the room she can't have talkers! Karleigh seems to really be learning quickly! She is studying living and non living things in science, and reads so well! I think she's in for a great year! 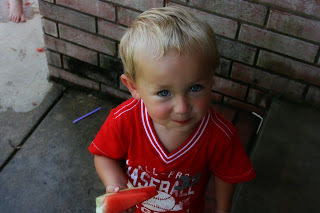 Kole says, "tank ooo Paw Paw"...."mmmmm"! 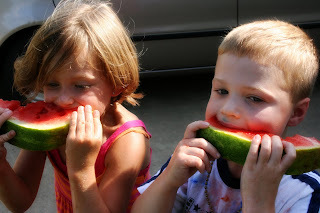 They said "This is goooooooood!" 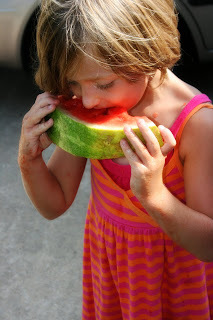 We all enjoyed the watermelon very much, and Mom just LOVED cleaning us all up! I don't think Kole is having much fun! I'm loving the shoes Evan! Well, the end of summer is here...school is starting, and we had to get in just a few more days with Evan. 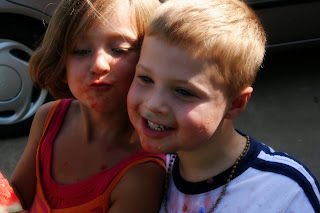 Karleigh and Evan have been friends for as long as they have been alive. They didn't know they were friends until a couple of years ago, but ever since they realized it they have been pretty much joined at the hip! I should post past pics with Evan...that could be another entry. Anyway, Kim and I joke all of the time about when the day comes that they can't lock themselves in a room together. 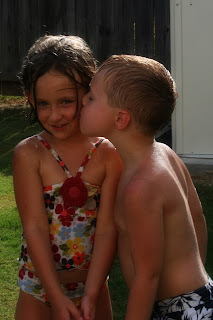 This summer Evan has learned that it's cute to tell everyone that he's going to marry Karleigh when they grow up. He told his mom many times, but then on vacation he got quite a lot of attention (esp. from teenage girls) when he told about his love for Karleigh so he told EVERYONE that would listen. LOL! Karleigh thinks Evan is pretty neat! She's always had a lot of boy friends at church, but I guess since Kim and I spend a lot of time together Evan has become one of the closest. 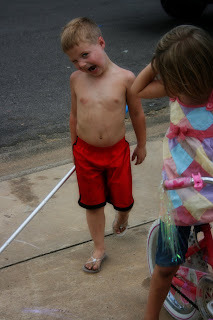 Jason made Evan mad this summer because he told him that before he could marry Karleigh he would have to ask him and his baseball bat (or something like that). I think it hurt Evan's feelings that Jason would even think about coming after him with a bat... OH the things to come! I think it's really funny to listen to Evan and Karleigh play. 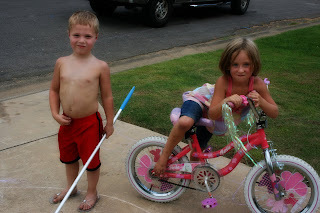 Karleigh can get Evan to do things that he would NEVER do otherwise, and Evan keeps Karleigh's tomboy side from getting too dusty! Some days they are inside playing house with the dolls and dress up clothes. Other days they are knee deep in mud, sand, and rocks or climbing trees. I think Kim has learned never to send Evan to my house expecting him to leave clean and dry...unless I wash his clothes while he's here! 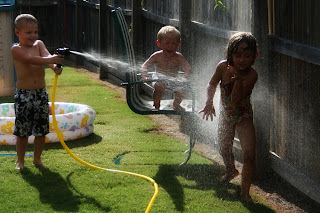 She used to tell him he could come over if he didn't get muddy or wet...LOL...no more, we just change clothes now! I know it's a mess when they get wet and nasty, but oh the memories they are making...and Evan always wants to stay longer! Sometimes I think those two are kindred spirits...they were together the whole week of vacation and I don't remember one big fuss! That's pretty rare for kids their age! Anyway, these were some of the last days of summer before Evan started kindergarten and Karleigh started first grade...LOTS of fun!